Butterbur, also known by its botanical name Petasites hybridus, or as ‘plague flower’, is a genus of the plant family Asteraceae. In the past, people used the plant’s rhizome and large leaves to wrap pats of butter to protect them from the heat – which is how it came to be called butterbur. As with so many medicinal plants, butterbur has a long tradition of use, supported by empirical observation and experience. . In the 17th century, it was used primarily to treat coughs and asthma. Recognised for its antispasmodic and analgesic properties, butterbur was found in the 1950s to have anti-inflammatory and anti-allergy properties too. Indeed it was given out free to treat migraine, allergic rhinitis and hay fever. The Swiss company Zeller capitalised on its benefits, marketing it as ‘Tesalin’, a product made from the plant’s leaves. With the benefit of modern scientific perspective, what then are the key benefits of butterbur? In relation to respiratory diseases (allergic or otherwise), two studies have shown butterbur to be a valid adjunct treatment for asthma, capable of reducing both the frequency of attacks and the dose of corticosteroids required. In relation to hay fever, standardised extract of butterbur leaf (Tesalin) reduces nasal congestion, sneezing, and itchy and watery eyes. These are classic antihistamine effects, but have the advantage of not producing the common side effects on sleep or gastrointestinal function of antihistamine drugs. In treating migraine, particularly persistent cases, 25 mg of butterbur (twice a day) can reduce the frequency and duration of attacks. Higher doses (100-150mg a day) have even been shown to reduce migraine attacks by as much as 48%! Based on this data alone, butterbur would merit reconsideration, but clinical studies have also identified an important new property for the plant: it is able to treat spasms in the urinary tract caused by stones and problems with bladder spasms. 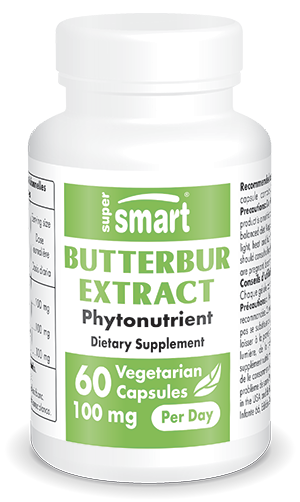 Butterbur also reduces urgency and frequency of urination, while relaxing the smooth muscle of the bladder by inhibiting synthesis of a type of lipid called leukotrienes. Which butterbur supplement should you choose? For maximum efficacy, look for nutritional supplements that contain extracts with around 15% active ingredients (petasin and isopetasin) and that are above all free from unwanted compounds such as pyrrolizidine alkaloids. It is vital these compounds are removed during the manufacturing process. It should also be noted that the average active dose is 25mg (twice a day), for a standardised extract containing 7.5mg petasin. Butterbur’s many benefits make it a unique aid for treating a range of health problems that are often unresponsive to standard medications which themselves are likely to produce numerous side-effects. Other ingredients: rice flour, maltodextrin, ascorbyl palmitate. Each capsule contains 50mg of Petasites hybridus extract.